"Street car just steps from your door!" Classic hardwood floors, retro radiator heaters, gas stoves, bright rooms. Call us today at 416-838-5587 to book your showing! 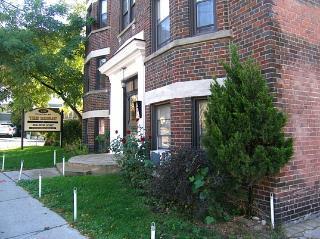 The Rideau is located just a couple blocks north of Torontos famous Beaches. Transportation is also a breeze because the Kingston street car is only steps away from your door. The Rideau reminds you of the good old days of old Toronto. This building has a comforting quaint retro feeling and it has tons of character. It is great for any active person who likes the convenience of the big city and the relaxed living of the Beaches with a touch or reverie. One of the very few rental buildings left in the city that has gas stoves! Any serious chef aficionado knows that a gas flame always delivers the even heat that leads to culinary master pieces. The environmentally conscious person will also appreciate that our electric and gas service are individually metered. Parking is limited but currently available. We also have a laundry room. Call us today to ask for availability!